Fri, 06/03/2015 - 09:43 Elise D.
On April 11st-12nd 2015, the UKNAO user group will organise the NAO Interfaces Hackathon in London. We interviewed Mike, one of the organizers, to get an insight of what the event is going to be about. Can you introduce us to UKNAO? UKNAO is the largest and most successful Aldebaran NAO robot user group in the world. 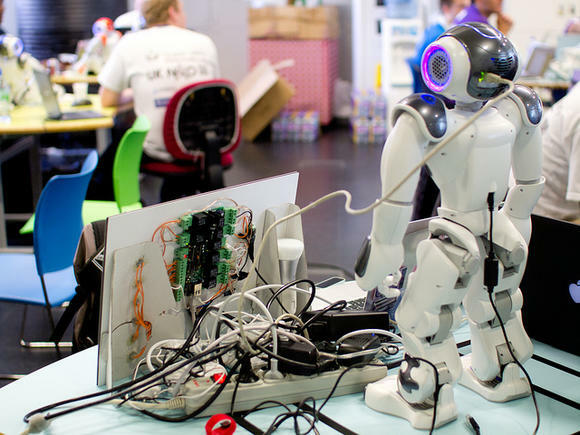 We have organised a number of very successful NAO robot themed hackathons and conferences including NAOConf in 2014 which was hosted by Queen Mary University in London and brought together developers, researchers, Aldebaran staff and academics from all over the world. We meet every six weeks in London, normally in a friendly pub, to talk robots, philosophise, work on NAO projects and drink beer. There is a core group of about ten members but our meetings are open to anyone with a passion for NAO and technology. You can find out more here. 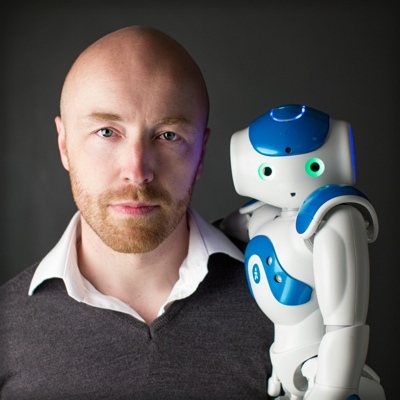 What is NAO Interfaces 2015 about? The inspiration for NAO Interfaces is robots interfacing with the world around them to make themselves more useful or to communicate in novel ways with people. The NAO Interfaces Hackathon is all about hacking up interfaces for NAO with hardware, virtual reality, software, wetware, cloud, wearables, crowdfunded projects, biological, smart homes etc. Again we will be hosted by Queen Mary University of London. Why did you organized this Hackathon and what do you expect from it? UKNAO typically organises one major hackathon a year because we enjoy creating interesting tech and robotics events and we enjoy meeting other interesting people. The intent of NAO Interfaces is to bring in developers and geeks from other technology areas outside the robotics field in order to cross-pollinate ideas and to facilitate networking opportunities. We hope everyone has a great time as normal and that some new ways for NAO to interact with the world and people occur. This is the third international hackathon, how the previous ones went? It was brilliant. People and teams came from all over the world and had a great time! (All the photos here). Which kind of devices are you planning to work with this year? It's really simple. If you think it can be interfaced with a NAO robot to extend the capabilities and communication of NAO then it will be good. Examples include Occulus Rift virtual reality headset, Leap Motion gesture sensor, facial verification systems, IfThisThenThat cloud software, Emotiv Insight neuro headset, skins moisture sensors …..
Who can join you guys (and how)? Anyone with an interface idea is welcome. Tickets are going fast, 50 in two weeks and now not many left so get booked quick! What did you learn thanks to your participation to this kind of event? Lessons learned are hard to identify as there are so many and overall it's about the experience of organising and taking part in such successful events.